What's better than participating in a race where you know some big name pros are starting off in the waters ahead of you or at the front of the start line? Well, almost better, since the racing is half the fun. The answer? Meeting them in person. 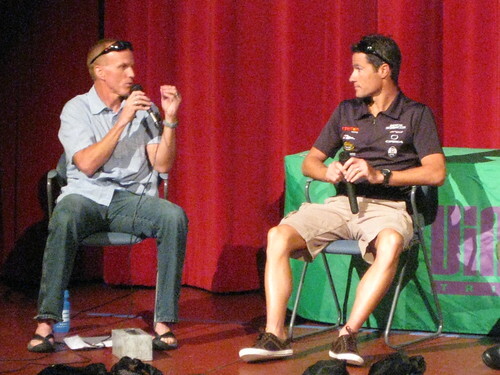 And that's exactly what I get to do tonight with two triathlon greats, Craig Alexander and Mirinda Carfrae. He's fresh off a win at the first Ironman 70.3 Racine (old course, new name, same race weekend). She's fresh off a win at the Vineman Ironman 70.3. They're both world champions, he at the Ironman and she at the Ironman 70.3. But both Craig Alexander and Mirinda Carfrae will be at the same place tonight: Arlington Heights' Metropolis Performing Theater's ballroom. As if that wasn't enough Ironman-related excitement, Chrissie Wellington, the three-time Ironman World Champion who smashed the Ironman-distance record this past weekend at Challenge Roth, will be there next week on Monday, July 26. Both events run from 7 p.m. to 8:30 p.m. and require a ticket to attend. Tickets cost $15 for one event and $25 to attend both events. The theater is located at 111 W. Campbell Street in Arlington Heights and doors open at 6 p.m. to get seated. The events are presented by Runners High ‘n Tri, where the owners are fans of Alexander and Wellington and are encouraging local fitness enthusiasts to participate in the Q&A sessions. Wellington appears on the wake of her recently announced multi-year partnership with Brooks, a key player in making her visit possible. The dynamic duo--now triple threat with the recent addition of Carfrae--will share their awe-inspiring stories of overcoming the seemingly impossible on their roads to the top. Bob Babbitt, co-founder of Competitor Magazine and an Ironman Triathlon Hall of Fame inductee, will moderate the Q&A sessions. The following Monday, July 26, the Dynamic Duo series will continue with a Q&A session with Wellington. "I'm excited to be a part of an event series in conjunction with my fellow Ironman World Champion, Craig Alexander, and am looking forward to sharing tips and having dialogue with other triathlon and fitness enthusiasts," said Wellingon. "I'm also honored to appear on behalf of the Brooks Running team. I'm very grateful for the support of my fans and I'm looking forward to a spectacular event with Runners High 'n Tri." Tickets are $15 per person for either event or $25 per person for admittance to both events. Tickets are available for purchase at Runners High ‘n Tri and they are required for entrance into the event. Attendees will have the opportunity to get a photo taken with Alexander and Wellington following the event. Event proceeds will benefit Alexander and Wellington’s charities, WINGS (a safe house for domestically abused women and children) and the Blazeman Foundation for ALS, respectively. I can't wait to hear what they have to say. And expect news from some exclusive interviews with them soon. Photos grabbed from thomas pix at flickr and examiner.com.